When you’re managing the many aspects of your professional life and your home life (and don’t forget about yourself! ), your to-do list can get out of control quickly. Sometimes it’s so extreme, you don’t even know where to begin. Overwhelm, anyone? In this episode, you’ll hear about the three steps to break the feeling of overwhelm and learn how to flow through your tasks, checking them off one after another. 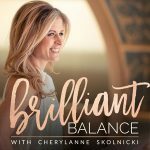 If you’re ready to get things done while feeling healthy, energized and inspired, unleash your full potential at Brilliant Balance Live!